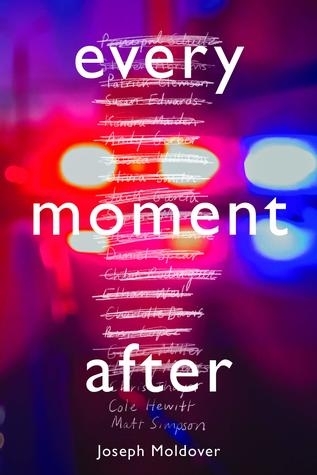 Today we're excited to chat with Joseph Moldover author of Every Moment After. Read on for more about Joseph, plus an interview! Joseph Moldover is a writer and clinical psychologist who lives and works in the Boston area. He has written a number of short stories (often under the name Joseph Sloan), as well as works of nonfiction focusing on issues of health and disability. He is the grandson of the novelist Sloan Wilson, author of The Man in the Gray Flannel Suit. Every Moment After is his debut novel, and will be published by Houghton Mifflin Harcourt in April, 2019. I wanted to write this book because I knew there was a story that wasn’t being told about gun violence in this country, and specifically about school shootings. My immediate inspiration was a school concert. I was there for one of my children, and it suddenly struck me that in these other schools where horrible violence had occurred life was also going on, ordinary things like concerts were happening, and it made me wonder: what is it like to go on with life with something so terrible in the background? I started to imagine high school graduation for a class that had lost some of its members years before, and that was the beginning of the book. The book is narrated by two 18-year-olds, Cole and Matt, alternating back and forth chapter by chapter. It’s hard to say who my favorite is; I can tell you that when I was that age I was much more like Cole, who is shy, awkward, and an aspiring writer. Matt is athletic, popular and outgoing; he is closer to the person I wanted to be! The idea for the novel and the basic plot outline came first. It came really quickly, in about twelve hours, as an intense inspiration. The title came soon after; I didn’t have to wait for the manuscript to be done. It might have been a day or so later, maybe even late that first day. I remember jotting it in a notebook. It felt very natural. It was what I wanted to write about: not that initial moment, the moment of violence, but all the ones after and how they must weigh on the community of survivors left behind. I’m actually really proud of the first scene, at the graduation. I wanted to bring the reader right into the story without a lot of exposition, but it was tricky because there’s this deep backstory hanging over everything and also a fairly large cast coming together. All of the people know each other and are picking up relationships that have been going on for years. So, I wanted to drop right into the center of that and have the reader understand exactly what is going on, what the significance of this event is and how it is affecting everyone and who all the people are, but not “tell” huge chunks of information. I don’t want to spoil anything but I also have to say that there is a scene with a garden gnome that has a special place in my heart. It starts out quite dark, but I really like where it leads. That relationships form the heart of a story. In the case of Every Moment After it’s the relationship between Matt and Cole, but in early drafts they didn’t spend a lot of time together. They sort of moved along parallel tracks, sometimes meeting up and then heading out again to pursue their own plot lines. Some of the best feedback I received early on was that they just needed to be on the same page more often. Once I started throwing them together in the same time and place things got much more interesting, and more emotionally compelling as well. I’m going to cheat a little and cite a book published in 2017 which I read in 2018: Turtles All the Way Down, by John Green. When I’m not writing I work as a child psychologist and I am very familiar with OCD. I thought his depiction of it was very authentic, honest, and moving. Plus, all of his books are lessons in how to tell a story in a well-paced, compelling, emotionally moving way. I have to say drafting. Revising can also be fun; it’s sort of like a puzzle, trying to get the narrative to fit together, the plot to balance, and the characters to work. But there’s nothing like the excitement of a sudden inspiration in the initial drafting. Drafting is definitely more enjoyable for me than the final work of revising. I don’t know if I would say that it’s a superpower, but I think that I am a very, very, persistent thinker. Obsessive might be another word for it. When I get a problem in my head – a scene that isn’t working, or a character or plot question – I work on it and work on it until I feel like there’s a breakthrough. It’s a useful characteristic for a novelist to have…although my wife has told me that it can be less than helpful in day-to-day life. Part of the energy that fueled this book was my passion around gun control. I find it heartbreaking that we endure tragedies like the one in my book again and again without managing to take effective action to limit access to guns. There are a number of organizations trying to do something about that; Everytown for Gun Safety is one I’d want to mention, and Sandy Hook Promise is another.